Crawfish Deviled Eggs are a twist on the same old deviled eggs! The addition of the seasoned crawfish tails adds a Cajun kick! 1 lb. (or more) crawfish tails; cooked, peeled, chopped and seasoned to taste. Scoop out the egg yolks gently, trying not to tear eggs and add to a mixing bowl. Arrange eggs on a serving platter, empty side up. Mash egg yolks with mayonnaise, mustard, salt, pepper or Cajun seasonings to taste. Sprinkle with smoked paprika if desired and serve. Add cooked crawfish claws to the top of the eggs in the middle for presentation if desired. 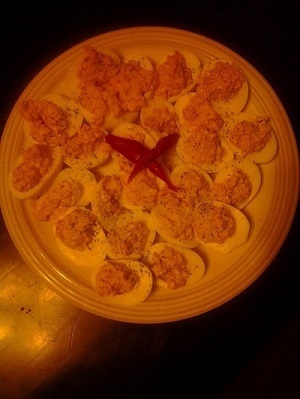 Recipe yields 12 crawfish deviled eggs. Variation: You may use cooked, chopped and peeled shrimp if crawfish are not available in your area. Recipe and photo courtesy of Thaddeus Hebert, used with permission.